It’s not every year the Kentucky Derby happens on a holiday! Cinco de Mayo and the Derby combine this year on the 5th of May. How would you combine Kentucky Derby fare – mint juleps and big hats with Cinco de Mayo’s tequila, margaritas and fabulous food choices? We’ve designed a few special invitations that celebrate both occasions on the 5th of May. 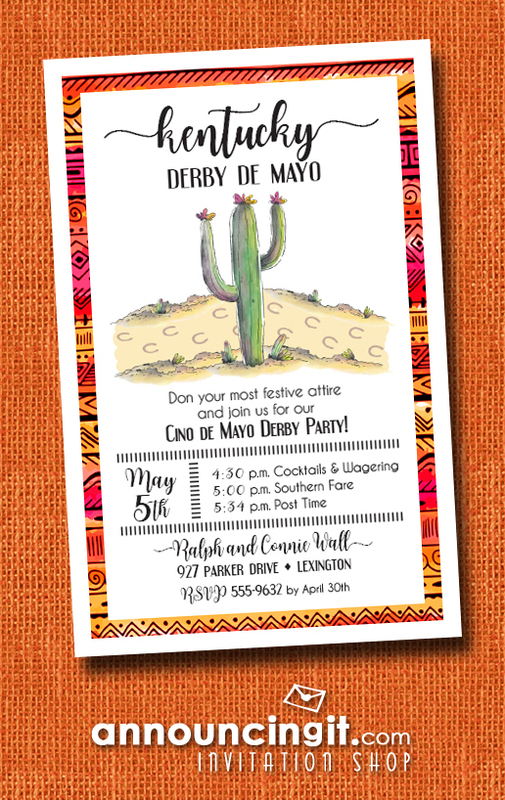 You’ll love the Cactus Kentucky Derby de Mayo Invitations with horse shoe prints on a winding dirt path past flowering cactus, and so will your guests. Whichever mint julep recipe you select, be sure you have plenty of crushed ice, fresh mint springs and fun glasses, silver julep cups or plastic tumblers to serve this signature drink to your guests. If you’re making your own Mint Juleps, you might want to add some of the bourbon for some recipes like Bourbon Mustard to serve with sandwiches, or maybe a Bourbon Pecan Pie for dessert. You can add a little bourbon to your barbecue sauce if you’re serving ribs or brisket or how about making some Bourbon Sea Salt Caramels? I sure you can find some great ways to use bourbon besides just serving it over ice. 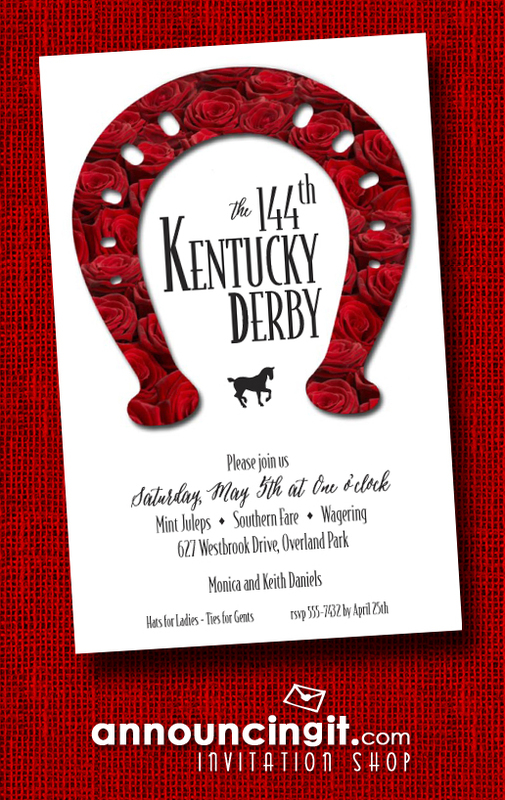 A horseshoe covered in red roses and a fun layout for your party information, the Rose Covered Horse Shoe Invitations are perfect to get the gang together to watch the Kentucky Derby the first Saturday in May at Churchill Downs. When you think of the Derby, big hats and mint juleps come to mind. Both are are a longstanding tradition at the Kentucky Derby. You can find spectacular hats custom designed and costing hundreds of dollars as well as hats glue gunned and bedazzled and created at home. 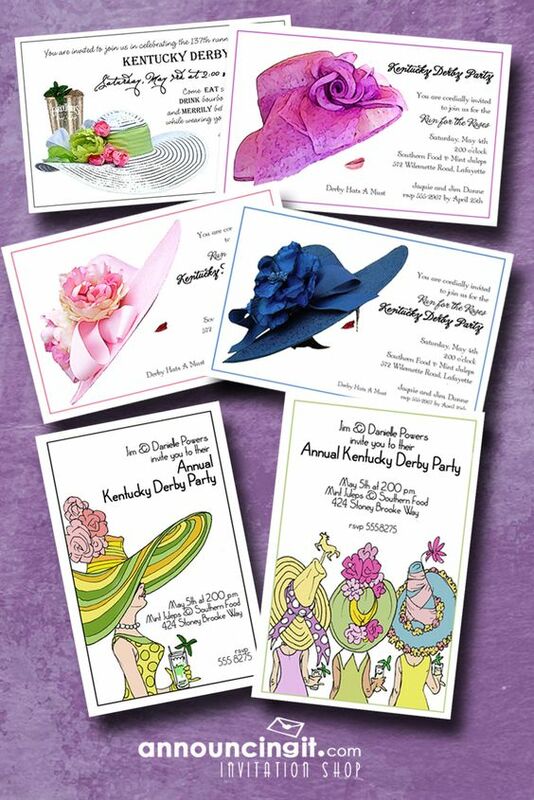 On your Kentucky Derby Invitations, it’s fun to require both men and women to come in their finest Derby attire. You can award prizes for the most stylish, the most creative and the most bizarre. Who knows, wearing a fabulous derby hat to the party may increase your odds at picking a winner come post time. 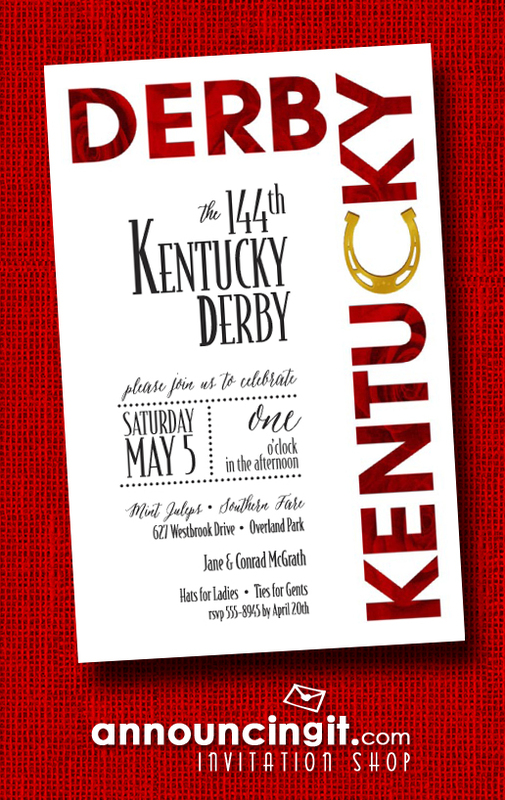 The Derby & Diamonds Kentucky Derby Party Invitations are a fun way to get your guests to wear their derby attire and celebrate the run for the roses at your Kentucky Derby Party. 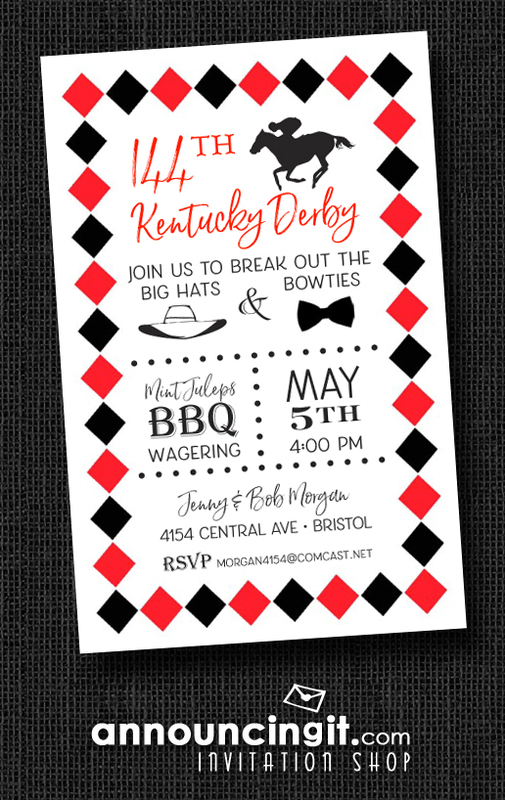 A border of bold red and black diamonds surrounds a fun party wording layout with various fonts, a lady’s hat, a bow tie and a horse and jockey silhouette. What do you need for a Kentucky Derby Party? Often referred to as the “most exciting two minutes in sports,” the Kentucky Derby is run on the first Saturday of May every year at Churchill Downs in Louisville, Kentucky. One year for my birthday, my husband and I went to the Derby (the year Barbero won the race). 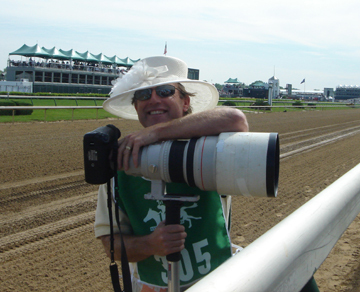 My derby hat (below) made it onto the derby track on the head of a sports photographer. You don’t have to live in Kentucky or attend the race to celebrate this event. 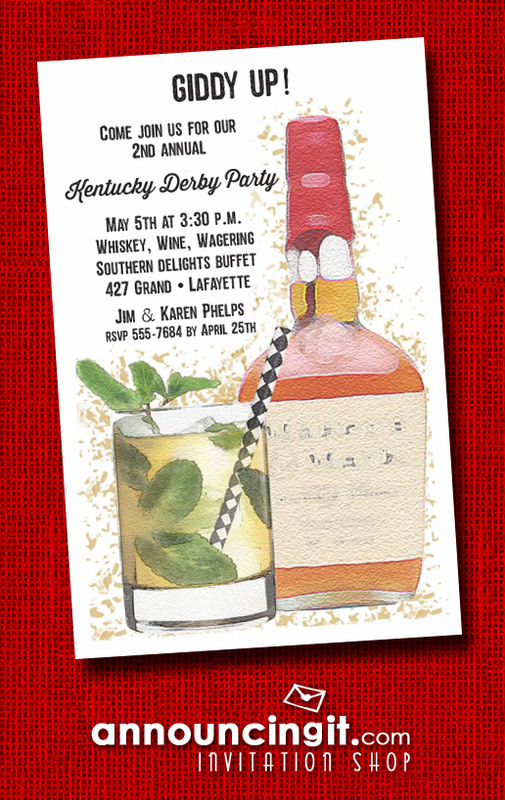 So what do you need for a fabulous Kentucky Derby party? A big screen TV to watch all the pre-race events and the actual race. Memorize the past ten winners before your guests arrive or astound guests with your knowledge of the Kentucky Derby winners all the way back to 1875 with our complete list of all the winners up to last year. 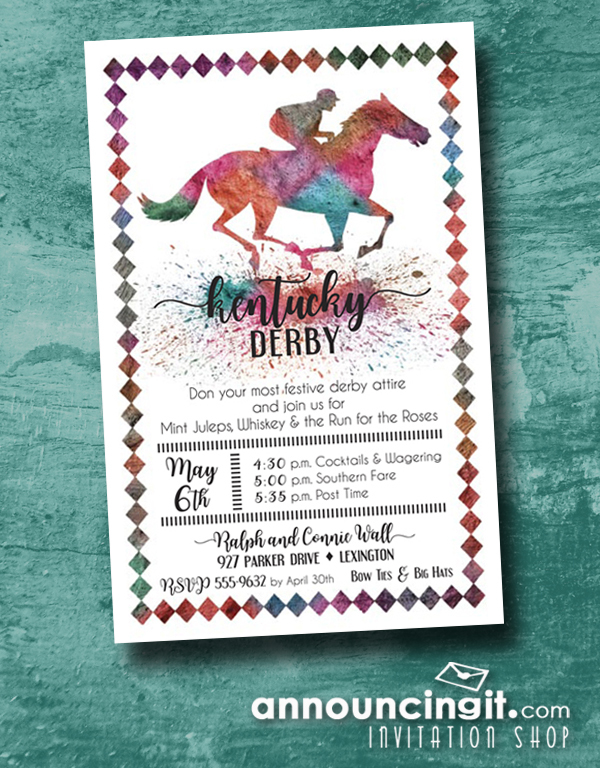 A brightly painted horse and jockey are racing towards the finish line – beautiful Kentucky Derby party invitations, derby themed bridal shower invitations, horse themed parties and more. And they’re off! Held the first Saturday in May each year, the run for the roses at the Kentucky Derby has been referred to as the most exciting two minutes in sports. 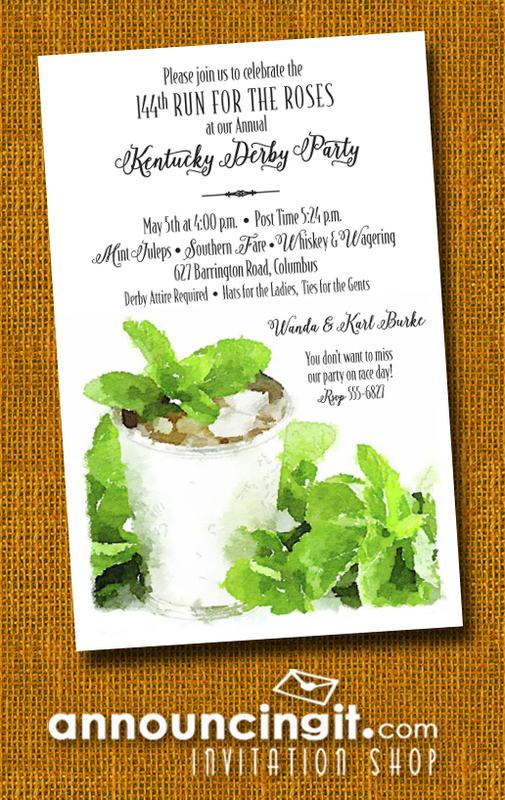 Even if you are not attending the Derby in person at Churchill Downs, there is no reason you cannot celebrate the day by throwing your own derby party. 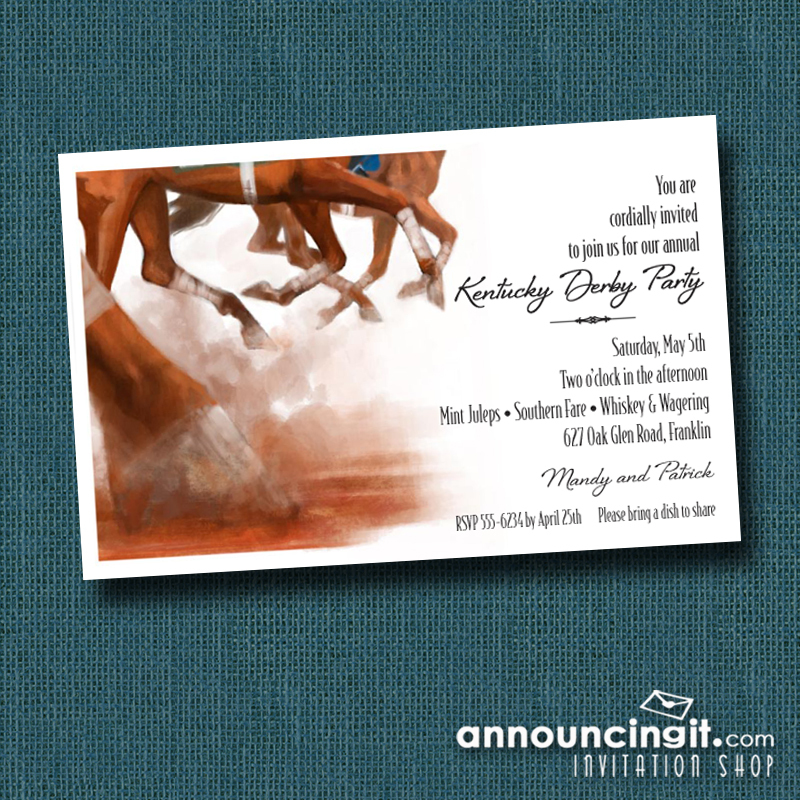 Once you decide if you will have an elegant, sophisticated affair or a wild and crazy in-field type bash, it’s time to order Kentucky Derby party invitations. 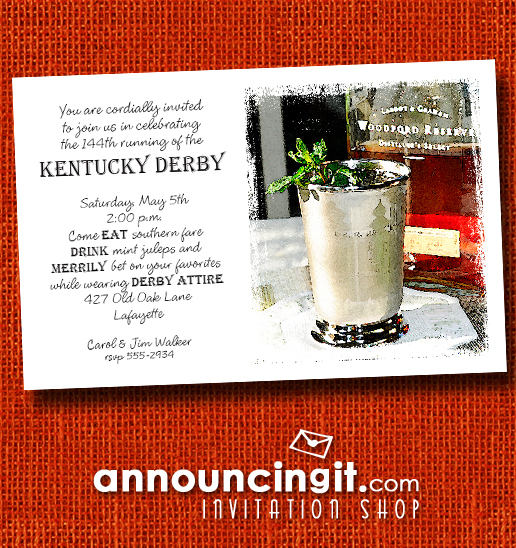 Announcingit.com has lots of unique, original Kentucky Derby party invitations to fit any style Derby party. It may seem like the wording of your party invitations is easy until it is actually time to get it done. You’ll find plenty of wording examples to help you with this part of the process. You will also need to include the party date, time, location and a phone number or email address for guests to RSVP so you can keep track of who is planning on attending. Requiring guests to RSVP will also help you stick to your budget for the party and can stop you from over or under buying food, drinks and other party essentials. 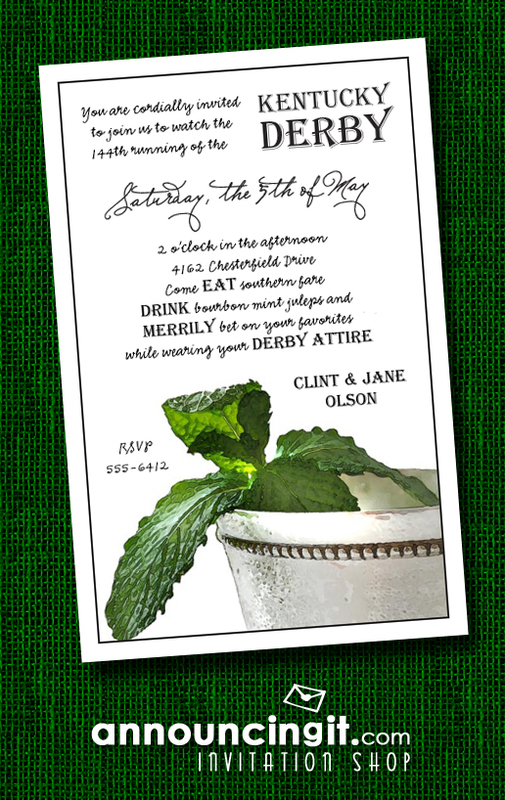 Of course, no derby party would be complete without Mint Juleps. Almost 120,000 mint juleps are served at Churchill Downs on race day. If you’re making mint juleps for your party, the one thing you will need is a lot of crushed or shaved ice! Mail your invitations 2-4 weeks before the date of the party and then enjoy planning a festive affair your guests will enjoy. 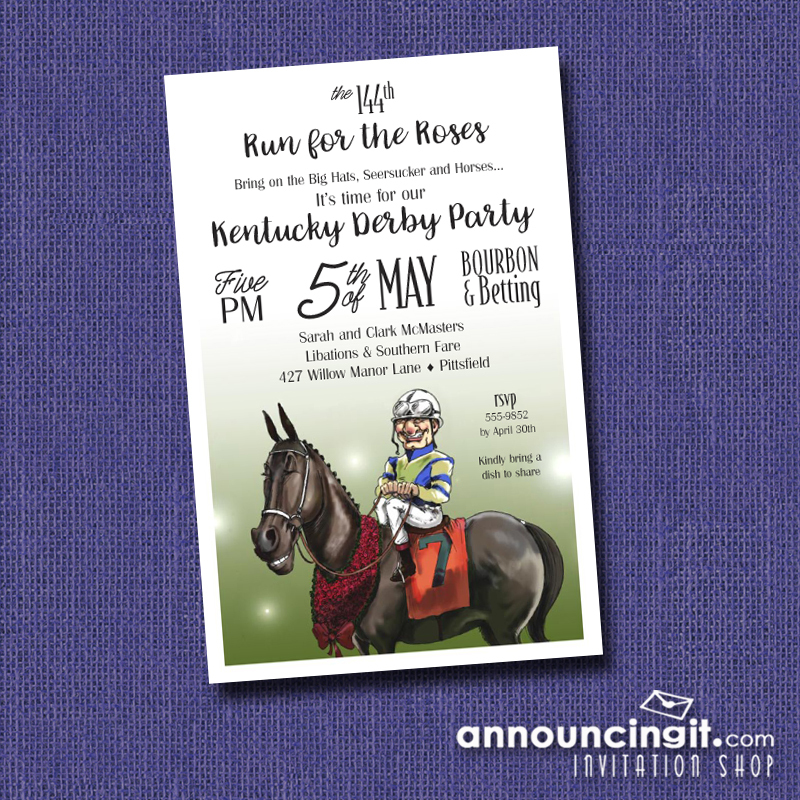 The words Kentucky Derby are covered in red roses and we’ve changed the “C” in Kentucky to a gold horse shoe and added a fun layout to the party information. We show the invitation printed on white paper, but you can upgrade to our shimmery white paper and envelopes for a perfect way to get friends together to party and watch the race. 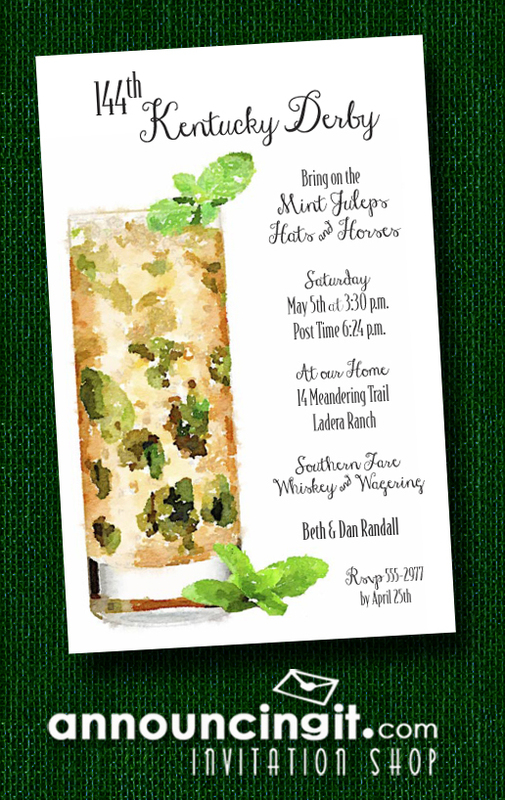 An ice filled tall glass with sprigs of mint holds a Mint Julep, the drink of the Kentucky Derby. 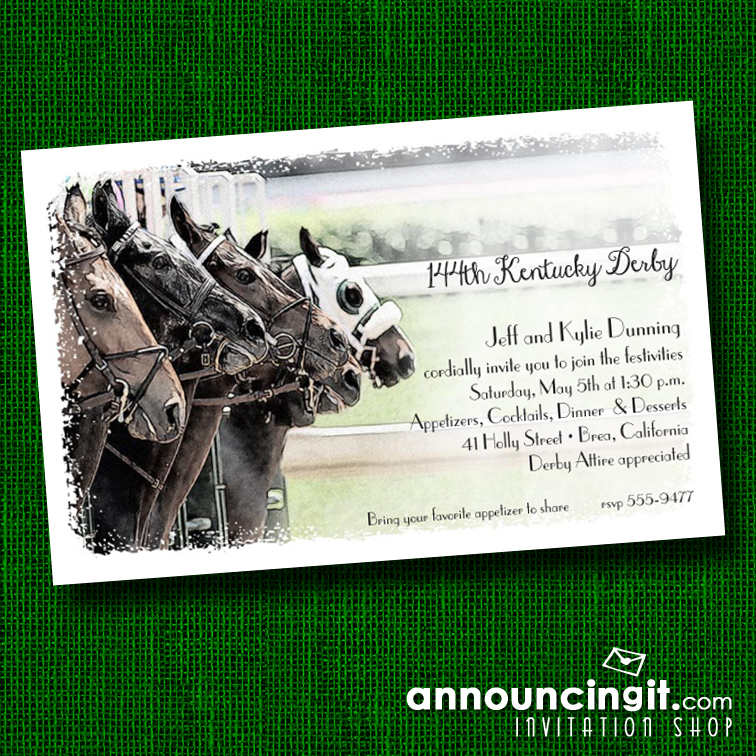 Perfect Kentucky Derby Party Invitations to get friends together to watch the race and enjoy hats, horses, food and friends.